The Veterans Memorial at the Crossings of Colonie was a collaborative design effort between Einhorn Yaffee Prescott, the Town of Colonie as well as interested community members. 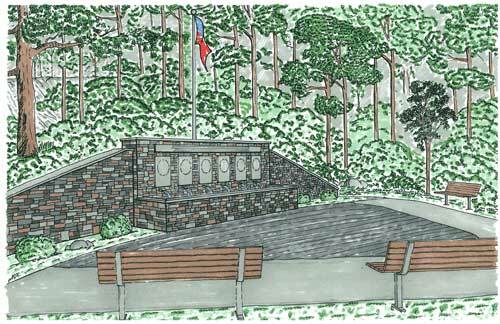 The basis of the design was to pay homage to those citizens of the Town of Colonie that have served in any of the six branches of the Armed Services in any conflict, while always being conscience of the Crossings natural surroundings. Below is a brief description of the final memorial design. In front of the reflecting pool will be stone pavers that will be inscribed with the names of town citizens that have served their country. These stone pavers will rest in the curve of the wall and offer an area of reflectance. The metaphor here is, the outstretched arms of the wall embrace these individuals while at the same time welcoming all who visit. At the perimeter of these pavers is another layer of pavers that will serve as a walkway around the memorial and ultimately the connection to the existing pathway. These pavers would also have the capability of being inscribed and the ability to serve our future armed service members. It is imperative that this memorial fit into its natural surroundings and at the same time be dramatic. The shear size of this memorial will lend to the drama, but how we treat the lighting, landscaping and the associated surroundings will also play a role in this drama. The plaques, reflecting pool and flag pole with be undoubtedly lit, but the approach to the memorial should also be carefully considered. This truly is a place of reflectance and it is this reflectance that needs to be portrayed in the ambience.